Beware of Facebook app: seems to cause note 4 to freeze! I was in the Facebook app and suddenly gray bars appeared across the screen, then a white screen and then the phone completely froze. I shut down the phone, restarted, and went to the Google play store (the phone was no longer frozen). I read horror stories of hacking, etc, in the FB app comments. So I unchecked auto updates, uninstalled, and disabled the app. Then I bookmarked the actual Facebook site on my phone. Seems to be working well so far. Just letting you all know my experiences. Thanks for the heads up. The Facebook app has a history of either bad updates or not working well. I have run into numerous threads about it (on various issues) for quite some time. Funny thing you you mentioned it... Just happened to me. I knew it was some weird App update that was freezing up the phone. Gonna disable it and wait for next update. P.S Can we keep this thread alive till next update that stables the app? An update won't help. There is a problem with the pre-loaded version. I've been dealing with this for a week (since I got my Note 4). I posted this on another thread. 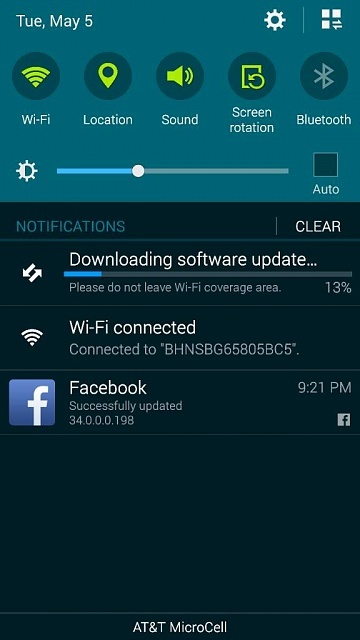 The pre-installed Facebook app is updating outside of the Play Store and bypassing security. I have been in discussions with Samsung and AT&T about this. You guys need to be reporting this to your carrier and Samsung. Make sure you turn off auto-updates in the Play Store so you can let them know it for sure is not coming through the Play Store. I wasn't even logged into any account on my phone, so no access to the Play Store, the app still updated directly through the app. The more people that report this to Samsung, the quicker something can get done. mike.mills.718 and janethayes like this. I remember a year ago noticing that my Nexus 4 would upgrade the Facebook app outside of the app store. There were lots of complaints about it here on AC at that time. Yup and it is doing it again. I've discussed with one of the Facebook developers, they are looking into this. They are not supposed to do this according to Google's terms. Anyone can send a message to the Facebook Android Beta page and you don't have to be a beta tester. I am a beta tester, I sent a message and sent them the info about my problem. I would suggest everyone do the same that is having the issue, provide screenshots if possible. I was getting a notification that wasn't a Play Store notification, but a Facebook notification, that told me it had updated. The more that complain to Facebook, the quicker they will do something. Same for me this morning. Auto updates are disabled in Play Store but Facebook updated itself in the background. Reporting to Google will also help. Maybe will help. There is a link to report that, but Google will be limited in what they will do with Facebook versus a smaller developer. Also while it is irritating Facebook is doing this, I have a bigger issue with Samsung. If Facebook can go around my security settings and download and install something, without getting my permission, others can too. This is why I suggest complaining to Samsung also. There is a problem if someone, anyone, can do this. The Facebook mobile web site is very functional and works great. Of course, I don't Facebook a whole lot, so the lack of instant notifications of stuff doesn't bother me all that much. This has been the fix for me so far. Clear the data on the Facebook app, then uninstall updates. Do not log into the Facebook app. Eventually it will update through the app. When you get a notification it updated, go to the App Manager, then downloaded apps. Look for these two files listed with your downloaded apps. Uninstall updates on those, then disable them. Then uninstall updates on the Facebook app and sideload the version you want or update through the Play Store. I use version 27 because it allows a tiny app to trick Facebook into thinking you have messenger and you can still message through the app. Starting with version 28, Facebook fixed that and no one has found a workaround for the newer versions of Facebook. If you call something taking 3 seconds to do, complicated, not sure what to say. No, it is a simple fix, not complicated at all, disabling apps isn't complicated. I give detailed instructions in fixes or explaining how to do something, because all aren't as always as familiar with how to do everything in their phone. ya i had some problems every now and then when i'm scrolling just to read any articles. Seems like it's an issue whenever they do updates on that stupid app. Well the big problem is the updates outside of the Play Store. This is a severe problem for me. There should not be any app that bypasses security to update on its own. Everybody knows that FB and the NSA are bedfellows, whats saying there looking threw your phone for anything and everything. Either Samsung or ATT needs to look into this for the concerns of their customers. Well it is happening with all carriers. I'm still in contact with Facebook, they are supposed to keep me updated. They know me well enough by now to know in won't let this go. That was my issue that Samsung couldn't understand, but AT&T seems to more understand. They need to take the word "Facebook" out of it. John Hacker Developer could make an awesome free app that many get and develop it just for this reason, to install malicious software. You understand the big issue, Facebook is frustrating me, the fact anyone can download and install on my phone around my security, makes me nervous. Facebook just updated on it's own again. Now it is up to 300mb. I don't like this. Can't uninstall it either. I have tried and it just updates itself again. This is unacceptable behavior. Try uninstall the updates, force stop, delete data and do not log into Facebook. Wait for it to update and when it does, see if you see those two files listed in the App Manager under downloaded and then uninstall their updates, and disable them. I don't know if it will work this way, I do know it will work with the original update with a new phone or after a reset. Also make sure all auto updates in the Play Store are turned off. How do you know Facebook is updating itself outside the play store? I haven't noticed this. Well I have the Beta version available to me in the Play Store and I had auto updates turned off, because I didn't want the update. I wasn't getting the newest beta version in my update outside of the Play Store, but just the newest public version. When it would update, it would still show I needed an update in the Play Store. Also the other night when they had to switch out my phone and I was updating via WiFi to Lollipop, I got notice it updated. I had not logged into this phone with any account, so the Play Store was not available to me. I saw this on my notification screen. Also notice, that is not a Play Store notification with that big fat Facebook icon. Also this isn't the first time Facebook has done this, they did it two years ago. Could it be that I am not seeing this because I am not on the beta? 2015 Hyundai Sonata upgrade via OTA or go to dealer for Android Auto??? Google: How can I fix the Bluetooth transfer of contacts to my car? Are There Any Disadvantages Of Installing CM 12 On RAZR M XT907?